The EcoProTechT Anti-Scale solution from EcoWater addresses the typical problems associated with hard water* without the use of salt or chemicals and without the wasted water of whole home reverse osmosis and ion exchange processes. EcoProTechT Anti-Scale system for hard water is NOT a water softener. It does not remove calcium and magnesium from water as softeners do. It is an anti-scale system that manages hard water by using proprietary PTT media. The PTT media converts hardness minerals from their ion form to a small crystalline form. This crystalline form does not readily attach to pipes, appliances and fixture surfaces. In fact, these microscopic crystals are simply rinsed away by the normal flow of water. The EcoProTechT Anti-Scale system is a scale management solution that uses proprietary PTT media. It is NOT a water softener and it does not remove calcium and magnesium from water as softeners do. PTT Anti-Scale Media - Reduces hard water scale from forming in plumbing and appliances. Up-flow Design - Increases contact time with media for improved scale reduction and higher flow rates. By-pass Valve - Allows for easy maintenance and servicing. Coconut-Shell Carbon (available on ETF2302SM10C only) - Filters the water throughout the home without compromising water flow. 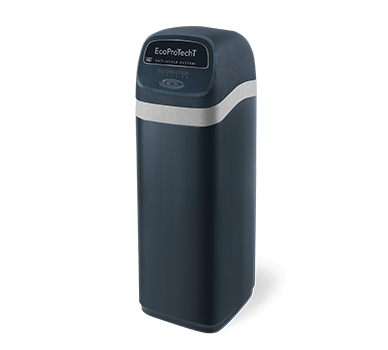 Removes chlorine taste and odor and eliminates the need for separate carbon filter changes. Multi-Wrap Fiberglass Reinforced Tank - Durable; doesn't deteriorate, rust, or corrode. Distributors - Distributors exhibit excellent flow rates. No Electricity - Simplifies installation, maintenance and reduces electrical hazards. No Salt or Added Chemicals Needed - Uses environmentally friendly "green" technology for areas with water or brine-discharge restrictions. Zero Waste Water - No backwashing required and zero discharge. Standard Plumbing Connection - 1" NPT Male connection for easy installation. Larger 1-1/4" and 1-1/2" plumbing adapters available.